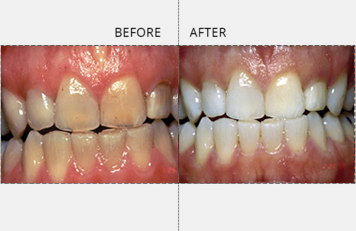 Bleaching teeth has been a dental procedure used by many dentists for many years. Since 1989 when the procedure was made a lot more effective and patient friendly the bleaching of teeth has become more popular. There are a few techniques available some using lights in the office followed by at home bleaching, some using lasers, and some using at home methods. The at home method has by far the most positive literature to support its use as a safe and effective bleaching technique. Both Drs. Small have been using this technique and Dr. Bruce Small has published research articles on the success of the at home tray method. Impressions are taken of your teeth and customized plastic trays are fabricated sometimes while you wait. The bleaching chemical is ordered directly from a local pharmacy customized to your individual needs based on strength needed for your case. You apply the bleaching agent at home and are monitored weekly at the office. It usually takes about three weeks to reach the maximum effect. The bleaching for this patient produced outstanding results.